FREETOWN, May 31, 2018 --- On World No Tobacco Day, the Ministry of Health and Sanitation joined WHO and partners in calling for a halt to the tobacco epidemic, asking communities, businesses, health workers and individuals to take a pledge to end tobacco use in Sierra Leone. Globally tobacco kills more than 7 million people each year, and is a leading but preventable risk factor for heart disease and cancer. In Freetown, the day was commemorated at a symposium and health fair at the National Stadium, as well as outreach at schools. The event highlighted the many health impacts of tobacco use, and the particular damage it causes to cardiovascular health. Evidence shows that as many as half of all tobacco users (including people who smoke cigarettes, chew or sniff tobacco and use shisha) will die prematurely from tobacco-related causes, while tobacco is linked to 1 in 10 heart disease deaths. Speaking at the event, the Deputy Minister of Health and Sanitation, Dr. Anthony Augustine Sandi pledged that the Ministry would continue to lead efforts to advance anti-tobacco policy and legislation, and help deliver robust awareness programmes. “We are committed to implementing effective interventions that support prevention and control efforts. For the public, media and community leaders, we ask you to join us in raising awareness on the harmful health impacts of tobacco, especially among our youth,” he added. Common forms of tobacco use include smoking of cigarettes, cigars and pipes, chewing and sniffing tobacco (‘snuff’) and use of shisha. All such forms, as well as exposure to secondhand smoke, are linked to significantly increased risks of cardiovascular disease, cancers, infertility, complications in pregnancy (when pregnant women are exposed) and other serious health conditions. The World Health Organization estimates that exposure to secondhand smoke (by those who are in proximity to smokers, whether indoors or outdoors) causes around 900,000 premature deaths globally each year. Close to one third of these are among children. Currently, the Ministry of Health and Sanitation is leading the development of a draft Tobacco Control Bill relating to the consumption, marketing and sale of tobacco products. Once passed, this Bill, which draws on evidence from countries that have implemented effective tobacco control measures worldwide, would provide landmark protection against tobacco’s major health, social and environmental harms. Dr. Santigie Sesay, the Ministry’s new Director for Noncommunicable Diseases and Mental Health acknowledged the strong partnerships that had made the No Tobacco symposium and health fair possible, and commended the youth who were helping raise awareness on the dangers of tobacco use among their peers. “Tobacco breaks hearts and affects almost every aspect of the body, and I hope we can all pledge to do our part to achieve a tobacco-free Sierra Leone,” he said. During the health fair, which was coordinated by the Ministry of Health and Sanitation, the Medical Missionary Movement of Sierra Leone, the NGO Forut and medical and pharmacy students, over 150 people were engaged on tobacco use, participated in blood pressure screenings and fitness tests, received medical counselling and referrals, and for those currently using tobacco, got practical advice on cessation. · Eliminating tobacco would protect millions from heart attacks and stroke.Tobacco causes close to 3 million deaths from cardiovascular diseases every year. Worldwide, 1 in 10 heart disease deaths are linked to tobacco. · Tobacco kills half of all its users. Tobacco is a leading cause of cancer, chronic lung diseases and diabetes. In addition, it causes infertility; impotence; miscarriage; bad breath and high blood pressure. · Cigarette smoke contains more than 4000 chemicals,including hundreds that are toxic, and at least 50 that cause cancer. These chemicals include nicotine, arsenic, ammonia and carbon monoxide. · There is no safe level of exposure to second-hand tobacco smoke.Second-hand smoke inhalation causes 900,000 premature deaths per year, many among children. The consequences of breathing this smoke can include severe heart and respiratory diseases, asthma and among babies, sudden infant death syndrome. No matter how careful you are, your smoke harms those around you. · All forms of tobacco use are harmful to health, including chewing tobacco, snuff and use of shisha (water pipes). Shisha smokers are at risk of the same kinds of diseases as cigarette smokers, such as heart disease, cancer, respiratory disease, infertility and problems during pregnancy. · If you use tobacco, quitting brings immediate and long-term benefits. In just 1 year, your risk of coronary heart disease is about half that of a smoker’s, while your lung cancer risk halves after 10 years. 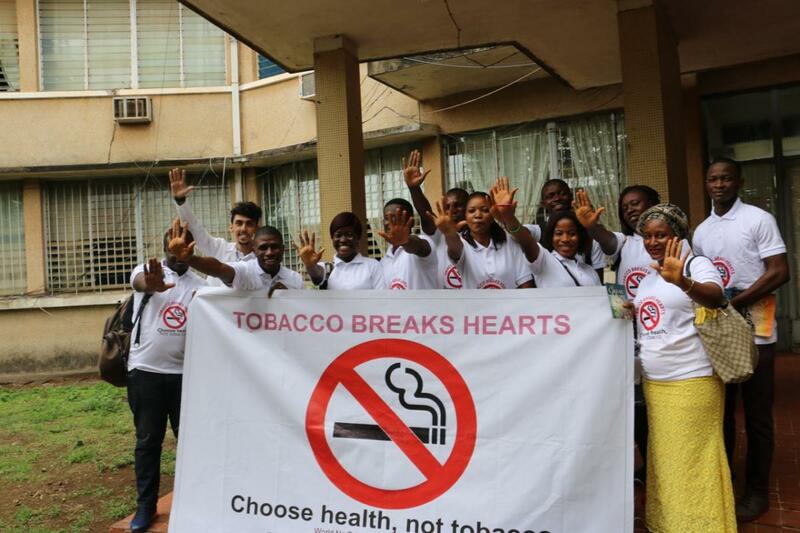 · Help us create a tobacco-free Sierra Leone! Take the pledge to be tobacco-free today. You can protect yourself, your children and your family and friends from the harmful impacts of tobacco, by making your home, workplace, communities, schools, public centres such as cinema houses and vehicles tobacco-free. · TheWHO Framework Convention on Tobacco (WHO FCTC), to which Sierra Leone is a signatory, is the world’s most powerful tool to tackle tobacco’s negative impact on development. The WHO FCTC entered into force in 2005, and its Parties are obliged to take a number of steps to reduce demand and supply for tobacco products. Actions addressed in the Convention include protecting people from exposure to tobacco smoke, banning tobacco advertising, promotion and sponsorship, banning sales to minors, requiring health warnings on tobacco packaging, promoting tobacco cessation, increasing tobacco taxes and creating a national coordinating mechanism for tobacco control.